The Sunshine Coast actually has two distinct parts, separated by Jervis Inlet, each having its own unique character. The lower portion runs from Port Mellon to Earl's Cove and the upper from Saltery Bay to Lund. My intention here is to provide extensive information about trails (and over time, other amenities) on the lower SC. Also, if you love the outdoors then this website is being built with you in mind. Maybe you already live here and just want to find some awesome new trails to explore, or you may be planning to come here for a visit and want to plan some great outdoor adventures. The lower (and upper) SC has some of the most beautiful wilderness areas in the world and a particularly enthusiastic community of mountain bikers who, along with other trail builders, have created some world class trails. Although many of the trails were built by mountain bikers for mountain bikers, hikers are welcome to use them as well - just keep your head up (and I would avoid hiking the downhill biking trails - particularly on weekends!). The Sunshine Coast is home to a unique program. Sprockids was started in 1990 by a teacher named Doug Detwiler as a Self Esteem/Anger Management Program for elementary students. It has evolved into an amazing multi-faceted, world renowned program that has helped thousands of young people develop skills, values and strategies to succeed in life. In 1993 Sprockids built the first officially recognized mountain bike skills park in North America. Check out the awesome trails at the Sprockids Bike Park. 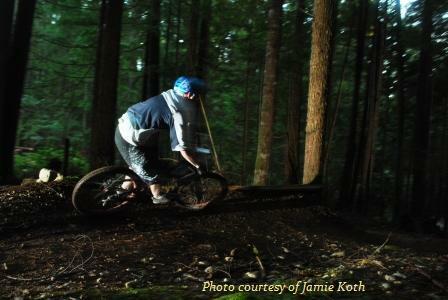 Click here to return from Sunshine Coast to the Sunshine Coast Trails Home page. 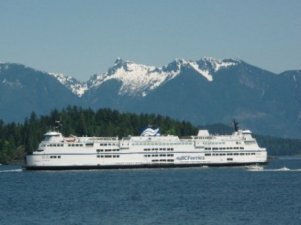 The lower Sunshine Coast is just a 40 minute ferry ride away from West Vancouver.